It is indeed an understatement to say that Italian food is well known, liked and appreciated all around the world. I don’t actually know many people who don’t like Italian food and the range of Italian restaurants spread all around the world certainly proves this. Being Italian myself, I see a big challenge though in keeping the “genuine” and ‘traditional” Italian food the same way it was passed on by all our wise grandparents to our new generation. Somehow, along the line, the “original” dishes got lost in translation….literally. I am not just talking about the ingredients themselves, (there is enough material to create another video only on this) abut also the spelling and the pronunciation of all these beautiful dishes. How many of you has said: “OMW, I love brusheda!”, not knowing that the right pronunciation is actually “bruce-ketta”? I do understand, though, that just because Italian food is so good and loved by so many, it doesn’t mean that everybody should know how to pronounce the words correctly. What it counts, after all is eating it. Right? But I am a language teacher and I am Italian and for some reason, we, Italians, wish that all our food could get pronounced “properly”, in Italy and out of Italy. This video is about “food crime” happening in the kitchen, linguistically speaking. I am referring to all the distorted versions that foreigners present when they sit at an Italian restaurant abroad, and wait for their “noki”, unaware that to our ears, it sounds like they are waiting for a Japanese starter. 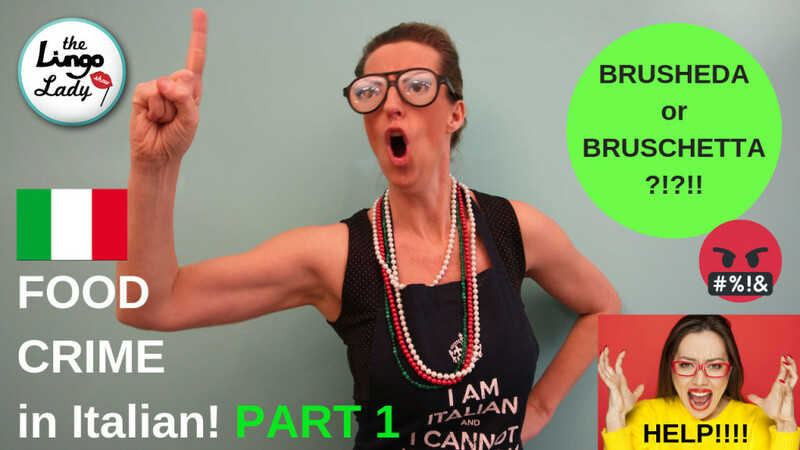 This video will help you laugh at yourself without being judgmental (auto-irony is very healthy) and learn the right pronunciation and spelling so you can brag to be a good Italian connoisseur next time you order at a restaurant on behalf of your friends.